The following review is of Robelyn Labs Elastin3 Advanced Stretch Mark Prevention Treatment. This cream claims to reduce the appearance of stretch marks and wrinkles to give a smoother and more useful appearance to skin. It also claims to work on women of all ages and on all skin types. Acetyl Hexapeptide inhibits the contraction of surface muscles, which allows elastin and collagen to penetrate deeper in order to repair scars and stretch marks. Hydrolyzed Collagen, Complex Soy Extract and Elastin Concentrate work to repair, reduce and prevent stretch marks. This product is unsuitable for those with a soy allergy. Elastin3 Advanced Stretch Mark Prevention Therapy should be generously applied to and affected area that has been cleaned and dried. The cream should be vigorously massaged into the skin using an upward motion. For best results, this cream should be used two to three times a day. 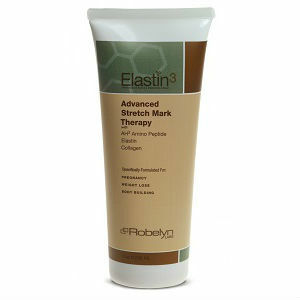 Robelyn Labs do not attach any specific side effects to Elastin3 Advanced Stretch Mark Prevention Therapy. However, there is a warning for nursing mothers to ensure that the cream is not used on an area where a baby may be able to ingest it. This shows that there may be severe effects if the product is ingested. Remember that the product is for external use only and that if it disagrees with you, you should seek the assistance of a physician and stop using the cream straight away. The regular price from the manufacturer of an 8oz tube of this stretch mark treatment is $79.95. The sale price is $59.95. This product is of good value as there is a lot of cream contained in the tube for this price. However, at the time of writing Elastin3 Advanced Stretch Mark Prevention Therapy was sold out. It is possible to subscribe to a regular newsletter to receive promotional offers. This company adds a 7% sales tax to orders billed or shipped to residents of New Jersey. This company has a 60-day money back guarantee. This means that the product is returnable within 60 days of purchase for a refund. This refund will not include shipping and handling charges and if multiple tubes are returned then only one tube is allowed to be open. The remaining tubes must have a factory seal still in place or they will not be refunded. The original receipt or a copy of it is also required. Robelyn Labs provide a long list of positive testimonials from their customers to demonstrate the massive satisfaction that the product has provided. Judging by the many comments, this cream is highly effective at hiding the appearance of stretch marks. This product appears to be quite popular as it has sold out and it seems to be effective too judging by the high praise that it has received from customers. The guarantee is fair although it has a number of strict guidelines that must be followed. The time to return an item is long enough and shows that Robelyn Labs have faith in the effectiveness of Elastin3 Advanced Stretch Mark Prevention Therapy. However, the side effects that may occur while using this product are unknown and the product definitely contains one possible allergen, soy. This means that this product is unsuitable for some people. The price seems acceptable considering how much of the product is contained in a tube although when sold at a regular price, the product may prove to be too expensive for long-term use. Overall, Elastin3 Advanced Stretch Mark Prevention Therapy seems to be a high quality product although it may not suit everyone. David Carney	reviewed Robelyn Labs Elastin3	on June 29th	 and gave it a rating of 3.